Today I needed to accumulate some hardware drivers for a certain range of models to be supported in my Operating System Deployment environment which is based on MDT 2013. Large hardware vendors like Hewlett-Packard and DELL have great support for drivers and driver packs suitable for enterprise client distribution methods like System Center Configuration Manager or Microsoft Deployment Toolkit. DELL features a great webpage on their website, from where all hardware drivers for business and enterprise supported hardware can be downloaded. A tool from where all related software, drivers, utilities, BIOS’ and more can be downloaded directly from HP. Along the way, using this tool I encountered some things that I think would be a great improvement for an upcoming release. Firstly, the possibility to apply a filter on the categories. 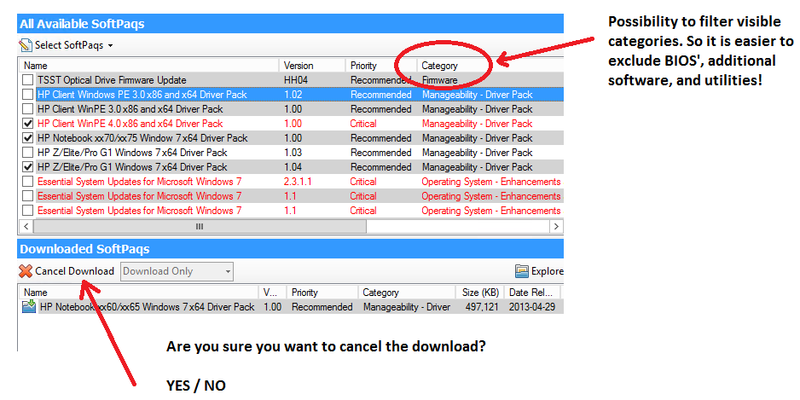 So that I can choose to only see “Manageability – Driver Pack”, or Driver’s. Another thing I encountered, is that my machine had already gone into energy save mode and powered off my screen. So upon mouse click, accidentally the download was cancelled, because the mouse cursor had not been moved, since I initiated the download. Resulting in the cancellation of the software I was currently downloading. Of course it was my mistake to leave the cursor right on top of that button, on the other hand, what’s a little extra wizard pane going to do harm, by asking if I’m really sure I want to cancel the download? And last but not least, why not throw in another option, to only download the latest, most recent version of any available software, instead of offering an entire history of versions which can be downloaded for a particular piece of software. To me it doesn’t makes sense, that when I’m downloading drivers, or BIOS’, the tool presents me all the content there is. Just offer it as an option: Do you want to see the latest available software, or the entire library? 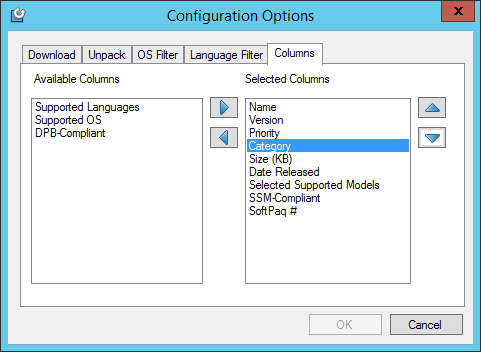 A quick peek in the HP Forums, on this topic, brings under the attention that this functionality is already available, but only, if the HP Softpaq Download Manager is installed on a HP computer. Any suggestions, please feel free to post them in the comment section.